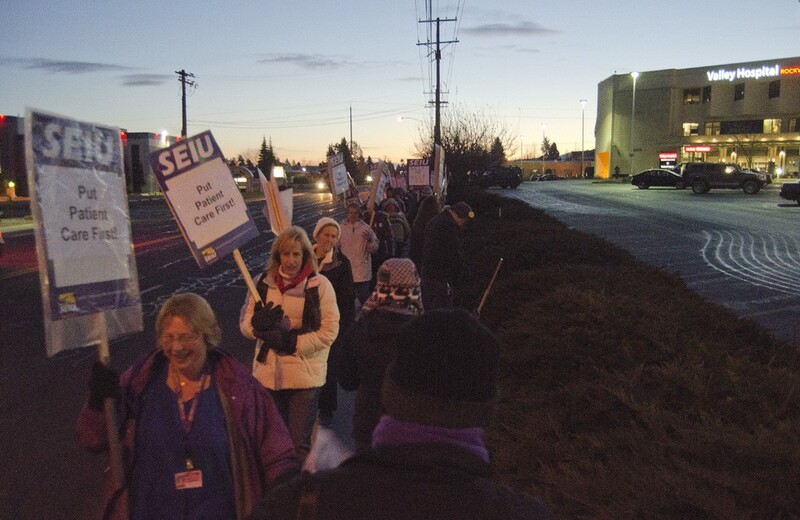 Union members and supporters march outside Valley Hospital as the sun comes up on Wednesday. Approximately 1,000 union nurses and hospital employees faced off against Valley Hospital and Deaconess Medical Center this week as both sides prepared for a one-day strike that union leaders described as potentially the largest health care strike in Spokane history. Local members of SEIU Healthcare 1199NW, representing nurses, assistants, technicians and other hospital staff, set a strike deadline for Wednesday as part of a yearlong effort to negotiate a new contract. Union workers argue insufficient staffing levels and other working conditions have left them dangerously short-handed. Teri Nicholson, a registered nurse with Valley Hospital, says union workers planned to walk off the job for 24 hours starting at 6 am Wednesday if a last-minute deal could not be reached. "We don't want to strike, but we have to stand up for our patients," she says in a statement. "We can't just stand by while the hospitals cut staffing." Sasha Weiler, communications director for Deaconess and Valley, says both hospitals have scheduled temporary workers, with proper licensing and certifications, to cover shifts during any strike. Hospital physicians as well as registered nurses at Deaconess, who are not represented by SEIU, will continue working. "We're planning to take care of our patients that day," Weiler says. For now, the county's Urban Growth Area expansion, the long-in-the-works decision to increase the boundaries where dense development can be constructed, is dead. Land-use groups like the Center for Justice and Futurewise have confidently been predicting the UGA expansion would be rejected when it hit the Growth Management Hearings' Board. Under the Growth Management Act, counties are supposed to use population growth projections to decide how much the urban zone can expand. But according to the hearings board decision, the county's attorney admitted the county did it the other way around: Forcing population growth projections upward to fit the size of the county's desired UGA expansion. But the legal problem wasn't the apparently ad-hoc projection — it was not advertising it. By not specifically informing the public when the population growth estimation would be changed, the hearings board found the county ran afoul of the law's public participation requirements. "They didn't have the numbers to justify expansion, so they changed them," says Rick Eichstaedt, executive director of the Center for Justice. "Without public participation." The hearings board also noted that extensive environmental impact studies showed Spokane County had more than enough room without expanding its growth boundaries. "A logical conclusion from this might be that the previous UGA boundaries were adequate, without any enlargement, to accommodate the projected growth for the County's population," the hearings board wrote.